Aaron Schock stayed here (Four Seasons Vail) well before his fall from grace (David O. Williams photo). The downfall of Republican Aaron Schock, the Republican congressman from Illinois now infamous for his globe-trotting adventure sports videos, started with an early February story in the Washington Post about Schock’s lavish Downton Abbey-inspired office on the Hill. But Real Vail readers may remember Schock as a fundraising stud who came to town early last year with a group of four other Republican reps to rub elbows with lobbyists and company executives at a Four Seasons event covered by The New York Times. 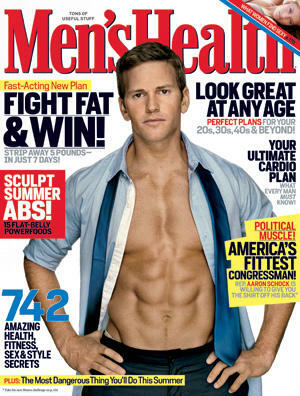 Men’s Health cover boy and now disgraced U.S. Rep. Aaron Schock. Real Vail helped report on that event and produced a local version that ran on Rocky Mountain Post. That version is re-posted below. The former rising GOP star is now stepping down at the end of the month, and while that will quash any congressional ethics probes, it won’t keep federal investigators from picking over Schock’s campaign finances. The feds “are now investigating how taxpayer and government money was spent by Schock, and they’re looking for any possible criminal conduct, including questions about Schock’s use of chartered planes, taking a large group of staffers to New York — plus outsized mileage claims and the use of campaign funds for meals,” according to the Chicago Sun-Times on Friday. Posh ski resorts in Vail, Aspen and Park City have long been playgrounds of the rich and famous, but increasingly they’re fertile ground for political fundraising and slope-side schmoozing between lobbyists and members of Congress. Democrats and Republicans alike take advantage of a loophole in federal law that allows campaign and political action committees (PACs) to fund ski trips that aren’t considered direct gifts – which are prohibited under a 2007 law – while lobbyists and corporations foot the bill. Earlier this month in Vail, five Republican congressman – Robert Aderholt (Alabama), Ed Whitfield (Kentucky), Aaron Schock (Illinois), Adrian Smith (Nebraska) and Mike Pompeo (Kansas) – all took part in what was dubbed a “Winter Escape to Vail” at the swanky Four Seasons Resort. A number of lobbyists from such companies as Shell Oil and PPL Corp, a major eastern utility company, also attended. Several of the congressmen spent two and half hours noshing on wild boar bacon-wrapped prawns and lobster and scallop tacos in a private room called Out of Bounds at Flame restaurant. An Aderholt invitation to the Winter Escape to Vail suggested $2,500 PAC contributions and $1,500 personal contributions. 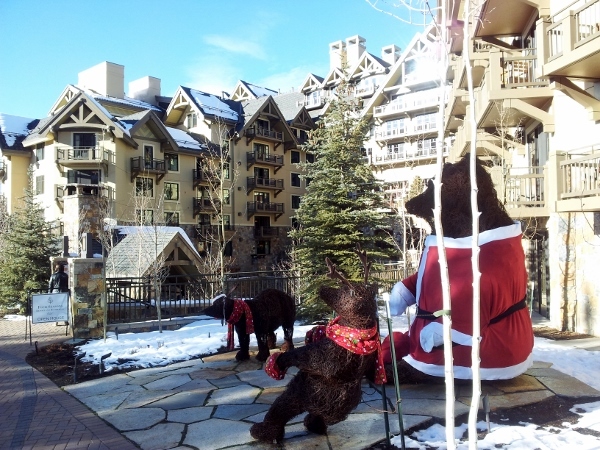 “I’ve been coming here since the early 70s and I’ve never seen fundraisers during peak ski season, the holidays. So, unless they’re skiers, get them out of here,” said Grant Bonser of Chicago, who was passing by the Four Seasons that day. Randy Milhoan, a longtime local artist and gallery owner and former chairman of the Eagle County Republican Party, echoed Bonser’s sentiments in a phone interview. Bonser joked that both political parties should stay away during peak ski season.